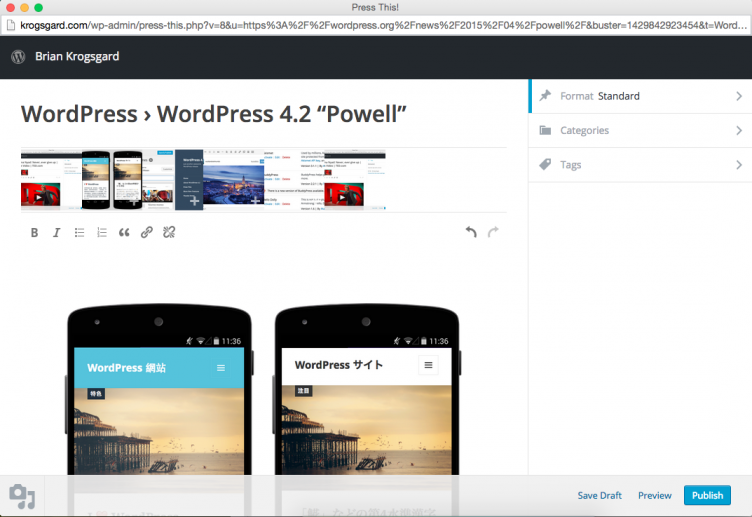 WordPress 4.2, “Powell”, has been released. The release was lead by Drew Jaynes and includes contributions from 283 community members. WordPress 4.2, Powell, marks the impressive sixth major version in a row on a four month average development cycle. This streak of consistency in WordPress releases is not accidental. Groundwork was put in place organizationally, technically, and philosophically to help ensure consistent, iterative improvements for WordPress. The project has always been quite good at updates, if compared to competition. However, a few releases prior to 3.7 got sidetracked, distracted, or thrown off schedule if held to our own high standard. Concepts such as the introduction of feature plugins have helped put sanity and routine into the release schedule, even without repeat release leads these last six versions (and none will repeat at least through 4.4). It’s quite possible even long term WordPress users have never heard of, much less used, Press This. However, the bookmarklet makes sharing and publishing others’ articles on your own blog quite simple. It was long overdue to either be cut from core or completely revamped. It was completely revamped under the “feature as plugin” model, led by Michael Arestad. I’ve been using the new Press This or a while now on my personal blog, and it’s really great. If your goal is to blog more regularly, and you like to curate or share what you’re reading/watching, you’ll love Press This. You can find the bookmarklet in the admin and primary Tools page. The editor is modern and honestly a great prototype for what could be a future full WordPress editor. The bookmarklet sits in my bookmarks, and it’s encouraged me to more often blog my thoughts on what I read — versus leave my thoughts with a single Tweet. I was at first on the fence as to whether Press This made sense to get a revamp. I’m now convinced it was a great decision, and the team that worked on most of the features was outstanding. There are more features coming to Press This. You can check some of them out on Michael’s blog post celebrating its inclusion in 4.2. If you’ve never pressed anything with Press This, definitely give it a shot. Another feature plugin that made it into 4.2 is the Customizer Theme Switcher. Relatively self-explanatory, this feature brings the theme choosing experience to the customizer. The project was lead by Nick Halsey, and you can find the core proposal for the feature on the Make WordPress blog. Not many folks using WordPress as a full CMS will change themes that often, but for those that do, the move for selecting and testing themes to the customizer makes sense. Shiny Updates allows for inline updates directly in the plugins admin screen, without a redirect to the funky plugin update progression page you’re probably quite familiar with. Shiny Updates is part of a larger effort for making both updates and installs better. Due to some potential UX issues and in order to stick with the release schedule, shiny installs was postponed. However, in a future release, the install and activation process for plugins will be a simpler process as well. WordPress can now handle all sorts of special characters by default, including Chinese, but also various glyphs and other symbols. And yes, emoji. Perhaps the most discussed and also misunderstood feature of WordPress 4.2, Utf8mb4 makes WordPress more accessible in more languages, and that is awesome. Also, don’t kid yourself: everyone loves emoji. 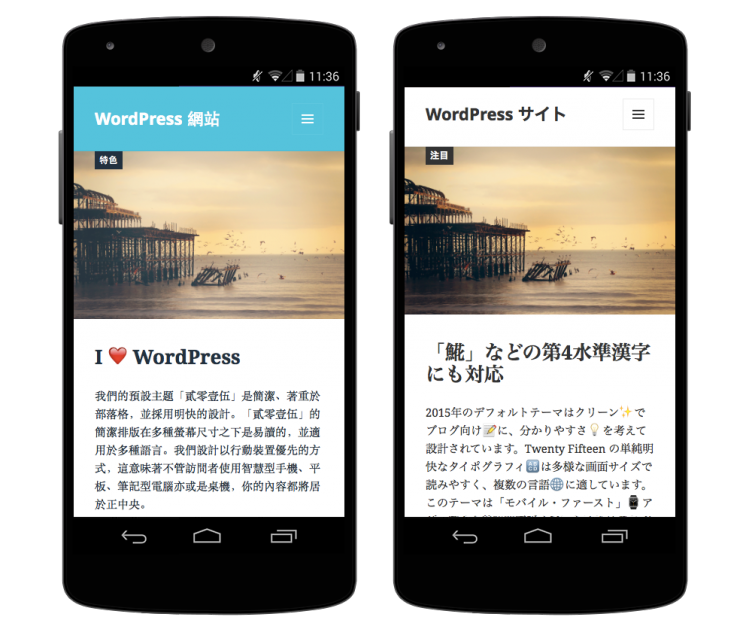 As WordPress is used more as a mobile app backend, this change will be especially welcome. Can you imagine an app that didn’t support emoji? Of course not. ? By the way, there is a handy Codex article that details how to enable the emoji keyboard on various operating systems. 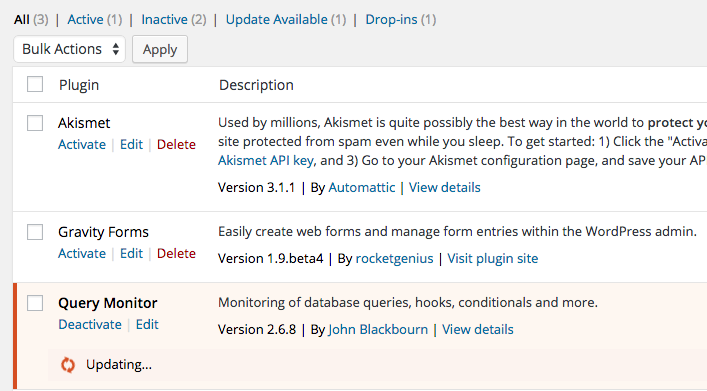 There are some great developer features in WordPress 4.2 as well. 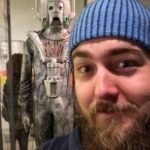 I highly recommend reading Aaron Jorbin’s field notes post that details some of the key features for developers and also has links to detailed posts to cover each one. WordPress 4.2 is an excellent release that has a nice balance of new features, fixes, and developer enhancements. Congratulations to the core team and everyone that was involved in the release of WordPress 4.2, “Powell”. I have just noticed the article URL!